The Aursund waste bin is a sturdy, ergonomically designed waste bin which can stand alone as a single bin, or be combined with others in a recycling station, depending on the number of fractions required by the customer. Comes with a connection kit if it is to form part of a group. Standard model has a sloping top with a smaller aperture, but alternative tops with covers, letterbox and bottle aperture are also available. Inside the bin is a removable bag holder with heavy-duty band which secures the bag firmly to the bin. There is a plastic tray in the base to collect liquids that have leaked from the plastic bags. There are soundproofing plates which ensure that there is no noise when the doors opened, and the bin is easy to close with twist locks. Underneath the bin are two wheels and two screw feet, which means that the bin can be moved for cleaning, but remains stable at other times. You can order the bin with four wheels or four screw feet instead, if you wish. 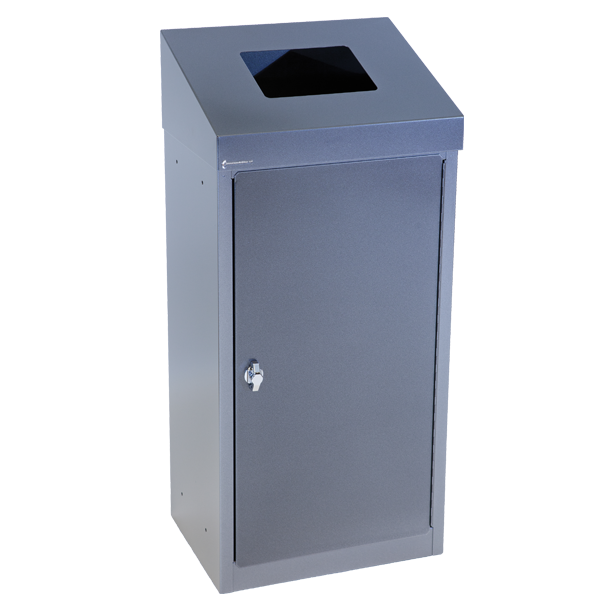 The standard model of this bin comes in powder-coated graphite grey, but you can order the tops, doors or entire bin to be coated in other RAL colours, for a small surcharge. Clear labelling is important for effective recycling. Fraction labels must be ordered as accessories. The bin is supplied fully assembled; all you have to do is put on the top/hide-a-bag feature at the user location.